I have a watercolour card to share with you today. After a few colourful card share over past few days, I decided to change it up and do a monochromatic card. 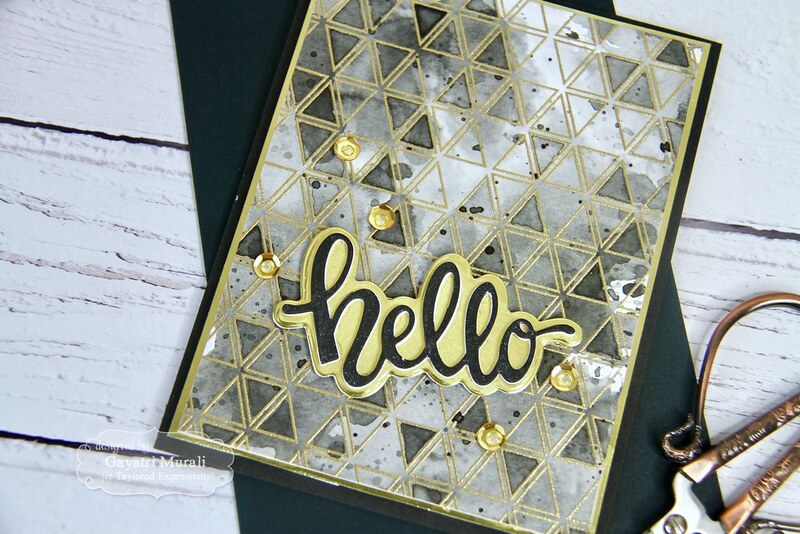 I have used Taylored Expressions Triangle Tetris background stamp, Hello Script die and Hello Script Backer die along with TE’s new Oreo Liquid Watercolour. I have used TE watercolor paper and the smooth side of the paper. I trimmed the panel to the size of the card front. Then I diluted the Oreo liquid watercolor on my craft mat and smooshed the watercolor panel on it. The first layer is a light grey colour wash. I dried this layer with heat gun and repeated the process couple of more times. The second and third time I used less water to dilute the Oreo liquid watercolour. 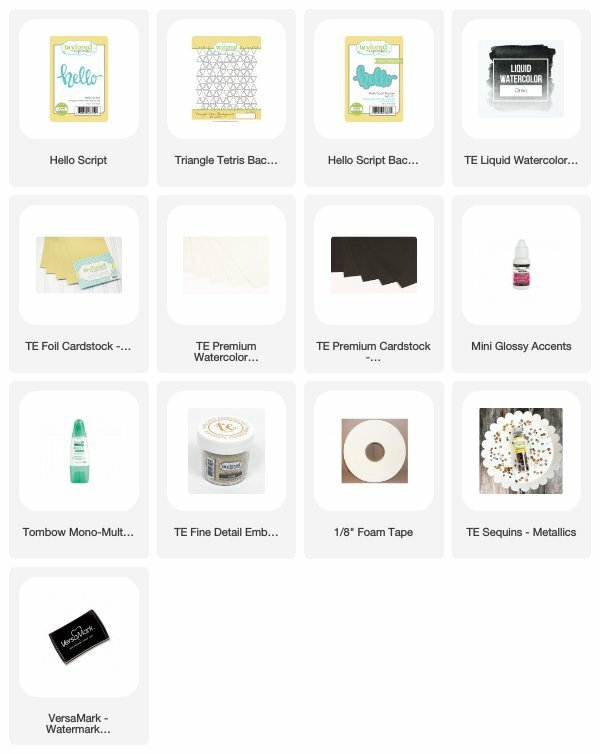 This gives gradient random layers. I love this. Once dry, I spattered some concentrated Oreo liquid watercolor. 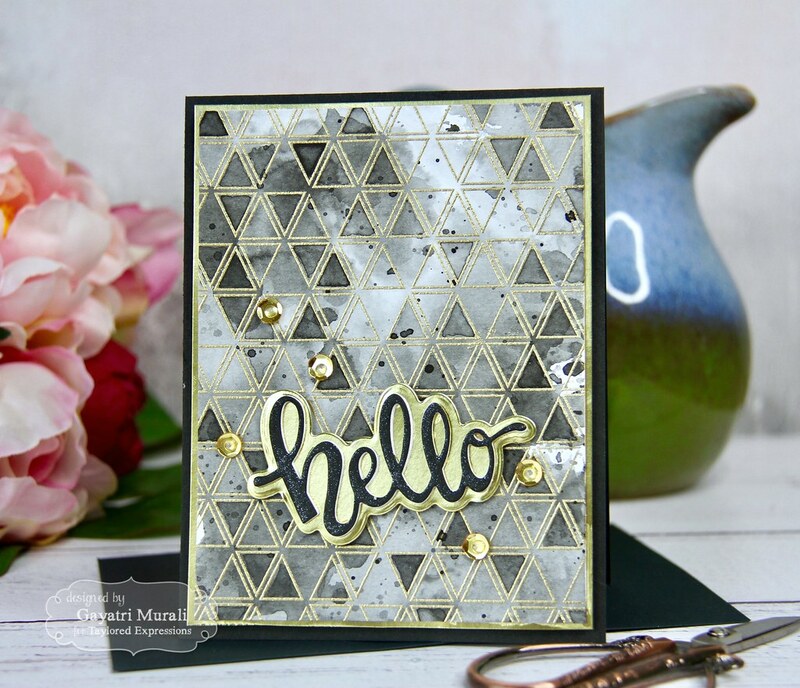 Once dry, I gold heat embossed the Triangle Tetris background stamp using TE’s Gold detailed embossing powder. Then I went back with various concentration of the Oreo Liquid watercolor to fill in randomly a few of the triangles. 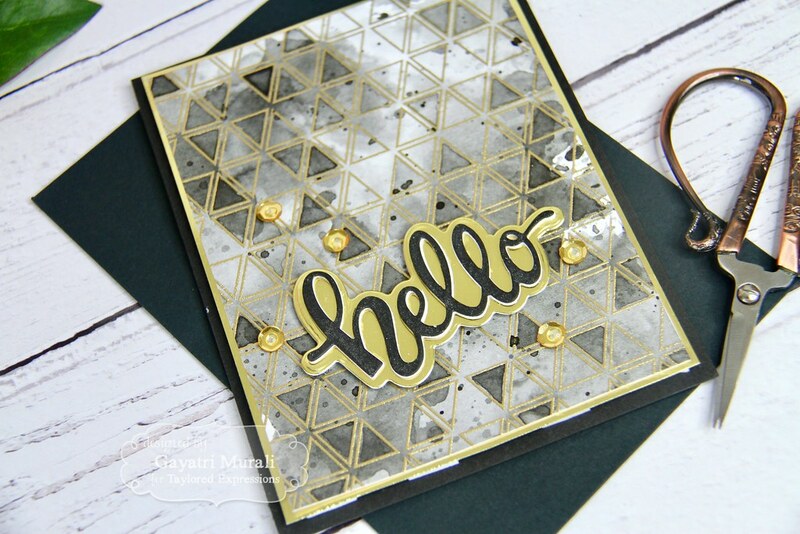 I love the shades of grey and black with the gold embossing. I trimmed this card to 5’x3.75′, matted the panel with gold foil cardstock and adhered the panel on the black card base using foam adhesives. For the sentiment I used the Hello Script and Hello Script Backer dies. 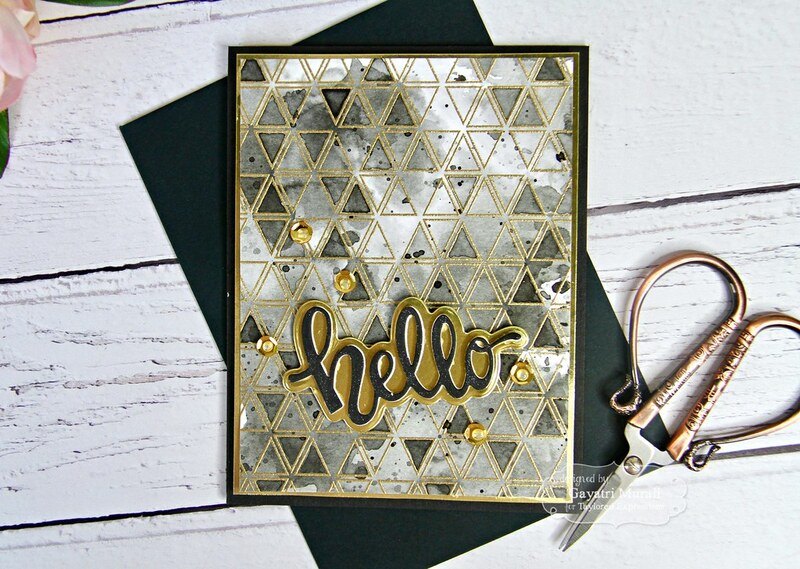 The backer die is die cut using the gold foil cardstock. 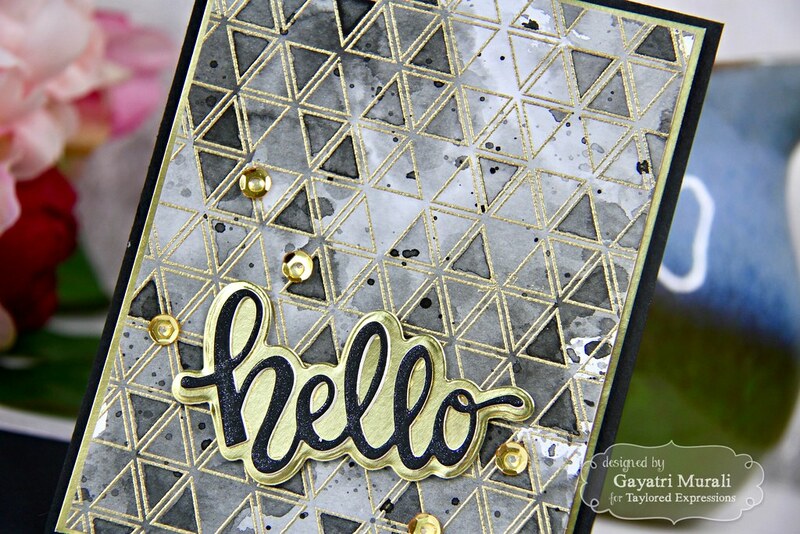 I die cut the Hello Script die using Sugar Cube cardstock and Oreo cardstock. I stacked the die cuts with the black die cut on the top. Then the entire stack on the gold backer die cut. I adhered this die cut sentiment on the card panel at an angle. Finally I added a few gold sequins topped with glossy accents.